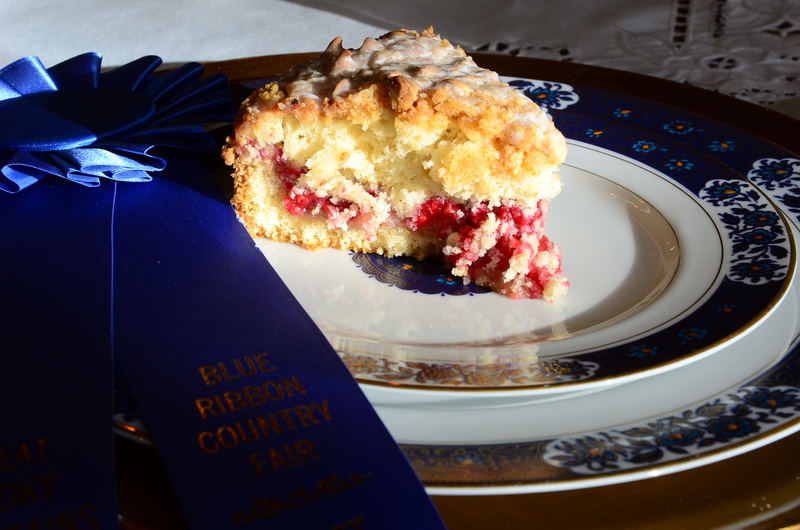 You can make this with either raspberry or blueberries. 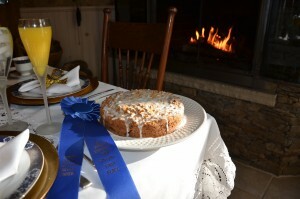 It won the blue ribbon at the local Great Smoky Mountain Heritage Center Blue Ribbon County Fair. Powder Sugar with enough milk to liquefy. Grease and flour an 8 ½ inch spring form pan. Make streusel by combining the three ingredients in a food processor until crumbly. Set aside. Beat flour, sugar, baking powder, softened butter, half and half, and egg until moistened, then one minute on medium speed. Spread half of batter in the bottom of the spring form pan. Then sprinkle on half of the streusel, a ¼ cup of white chocolate baking chips and raspberry or blueberries. Layer on the rest of batter and on top rest of streusel and white chocolate. Bake at least 1 hour or until a toothpick comes out clean. I use frozen blueberries or raspberries. If yours are fresh, the baking time may be a little less. Cool 10 minutes and remove from pan. Drizzle on some powder sugar glaze.